Sunday Sevens is a weekly blog series showing what you did in the previous week in photo format. 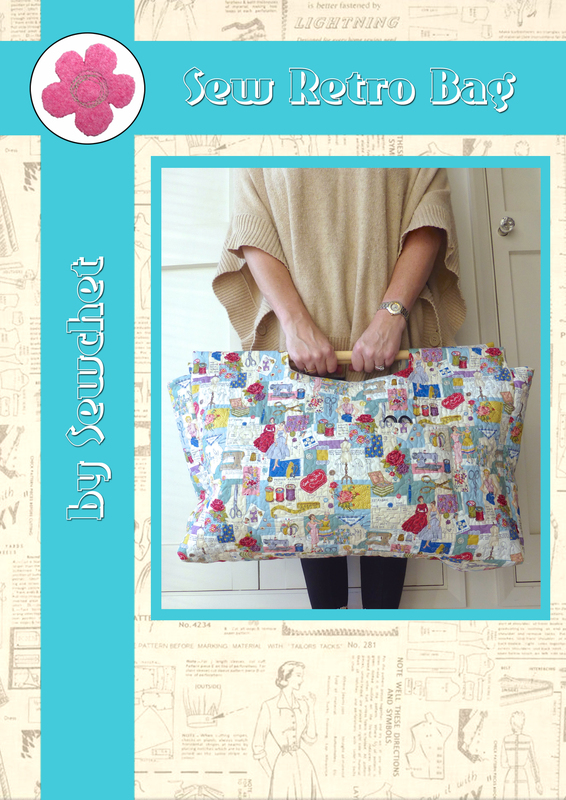 Visit Nat at Threads & Bobbins to find out more. 1. No, it’s no longer in the dining room – I’m sat on it in the lounge, but this is the photo I took when we took delivery of our ‘new’ sofa, another eBay bargain. I’ve also ordered a brand new one to go with it which should be here in about six weeks. Can’t wait to get rid of the two corner sofas that we’ve had for the last ten years! 2. 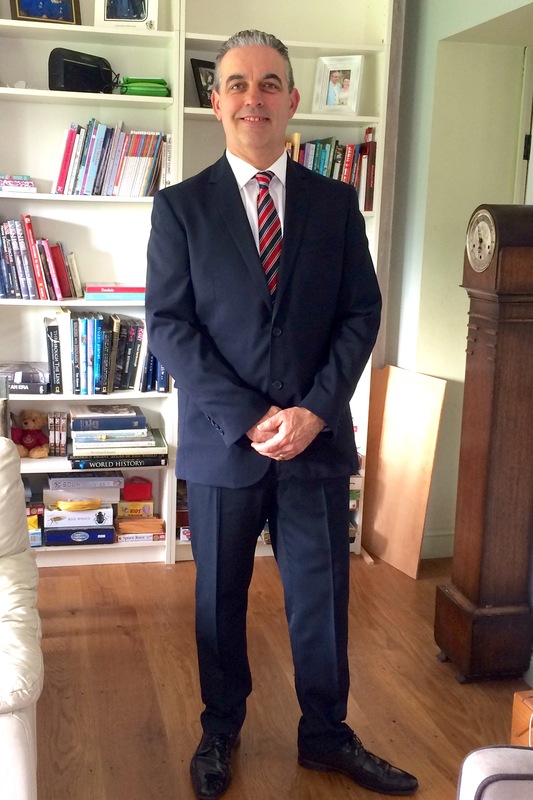 Here is Mr H-L looking very slim in his suit just before he left for an interview in Amsterdam. Over two stones lighter in less than two months – he got the job, too! 3. 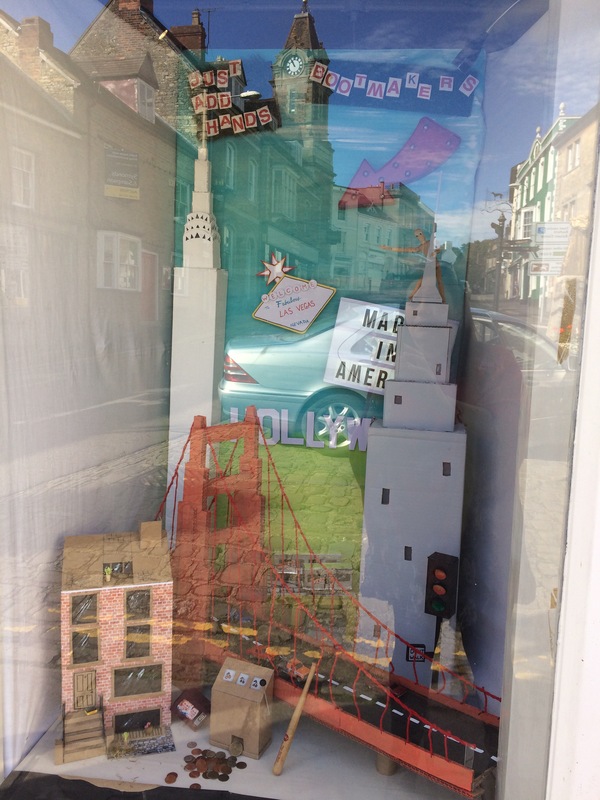 A change of artwork in the window next to the Post Office in our local town. 4. 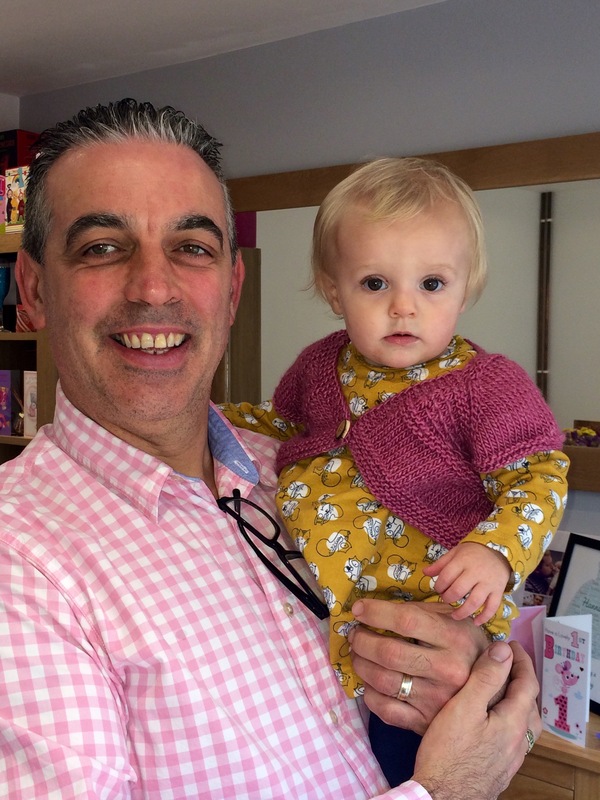 Mr H-L with our granddaughter in the cardigan I knitted her for her first birthday. 5. 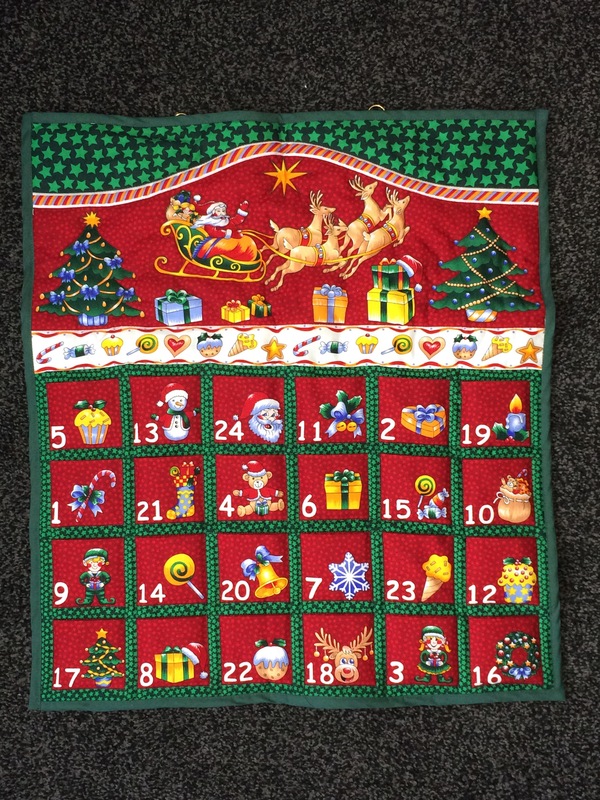 A bit of a cheat project – a pre-printed advent calendar panel that I put together and quilted, also for our granddaughter. 6. 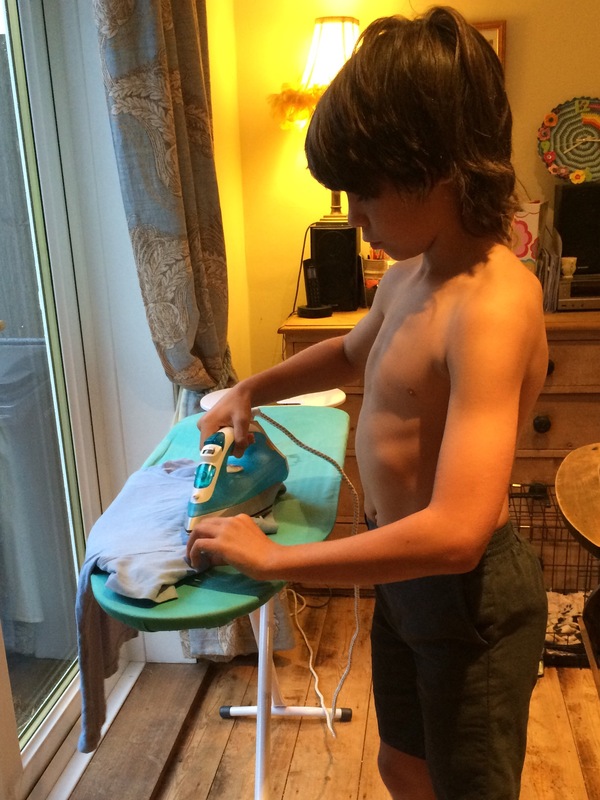 No.2 Son is now responsible for ironing his own clothes! 7. He won the school Conker competition later that same day – must’ve dazzled the competition with his perfectly pressed school uniform! 8. 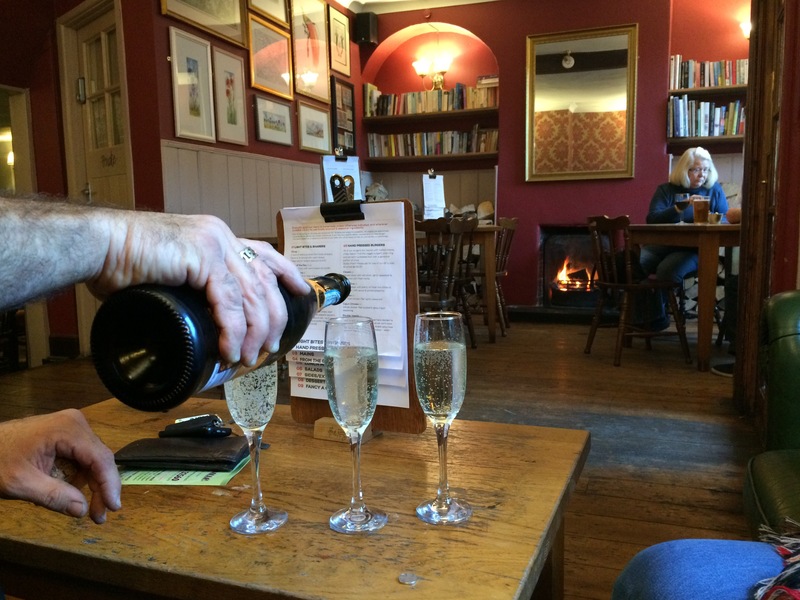 Popped out for a quick drink to celebrate Mr H-L’s job offer. The pub had their fire blazing and, even though its not really cold enough yet, fires are always so welcoming and cosy, aren’t they? 9. On Saturday we said The Boys could choose where they wanted to go for lunch. Did they choose McDonald’s or KFC? No. They instantly said ‘Tambourino Gold’, which is an Italian restaurant in Sherborne. 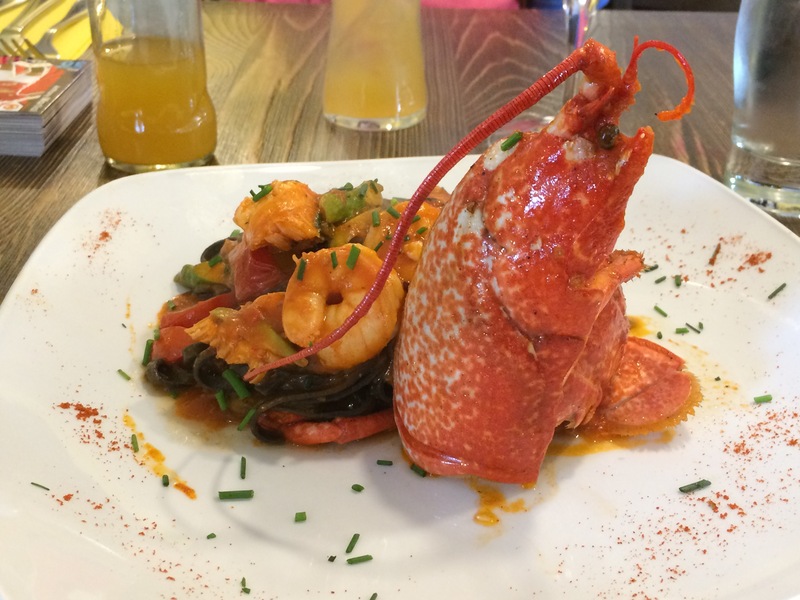 We had lobster which was a tad pricier than a Happy Meal. 10. 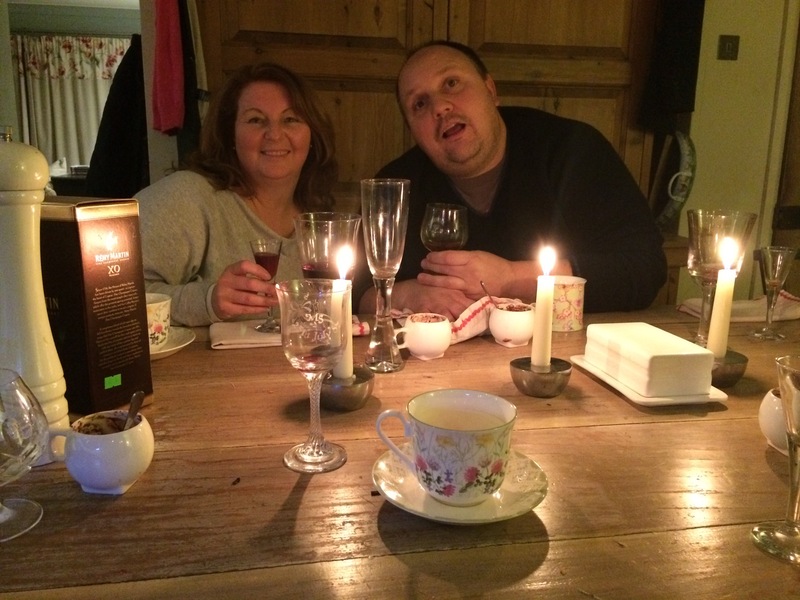 Friends came round for supper earlier in the week which resulted in a late night and a lie in. We woke up late and went downstairs to find them washing up the mess from the previous evening. Oops – not what good hosts should do! I did cook them a full English afterwards, though. 11. No.1 Son and his girlfriend all dressed up for a football Hallowe’en do. We promised to drop them off and pick them up which meant staying up until nearly midnight – something we rarely manage these days! Categories: Sunday Sevens | Tags: Advent Calendar, conkers, halloween, new job, sofa, suit | Permalink. Well done Mr. H-L. Does this mean you will have a commuting husband like me or was it just the interview that was in Amsterdam? Your granddaughter looks adorable – that first birthday is such an important event, even though they don’t really know what’s going on themselves. He’s the UK Corporate Account Manager and will only have to go to Amsterdam every quarter. The Boys screw their clothes up so I’d had enough and said that they have to do their own ironing from now on. They thought that meant they wouldn’t have to bother, but no – I refuse to let them go out with creased clothes and hope that it will teach them to fold clothes up before they put them away. Well, we live in hope! It was lovely to spend time with our granddaughter, even if she won’t remember her first birthday. Congratulation for the job!!! I wish we lived nearer so I could have the chance to cook you a perfect Italian meal.. Thanks T – so do I wish you could cook for us!! Congratulations on your husbands new job. I foresee much gadding about in Amsterdam for you in the future. My husband worked in Eindhoven for a while and loved it. Youngest son and me had a super weekend there. Your granddaughter is gorgeous. Thanks Cathy, although he’ll only go to Amsterdam every three months. I’ll try to wangle a trip with him occasionally, if I can get a babysitter, because I do love that city. 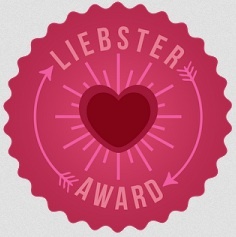 Lovely week for everyone – congratulations to Mr. H-L and Bertie! Good job on training the boys how to iron. It will stand them in good stead in future, so keep them at it. 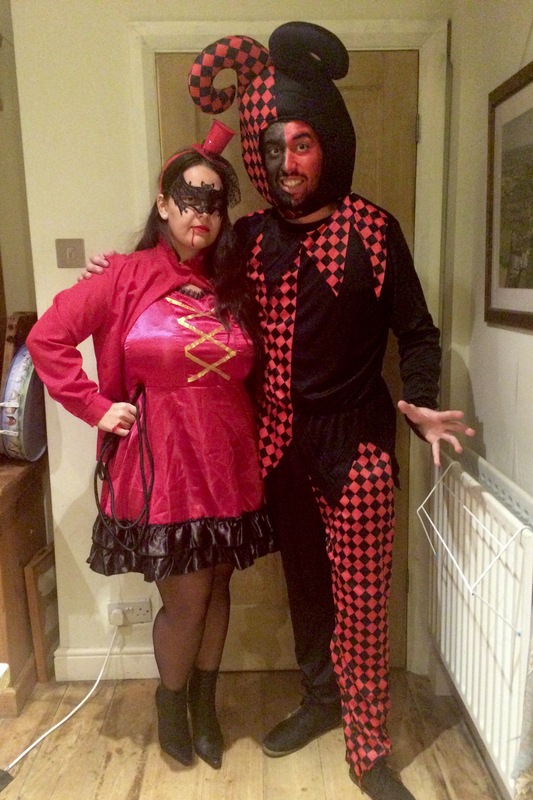 Hallowe’en costumes or just costume, elder son & lady did really well! Lovely new sofa. Know you’ll enjoy it. Have a lovely week! Thanks Del, I will definitely let The Boys do more for themselves now they are 9+10. No.1 Son is 23 and was absolutely independent before he went to university – unlike his flat mates who couldn’t cook, clean or operate a washing machine! The new sofa is much more stylish than the old one and I am impatient for the other new one to arrive. It will be weird with Mr H-L back at work in a proper ‘suited’ job. Weird in a good way, of course. Looks like you had another busy but awesome week. Your husband looks very handsome. Tell him congrats on the new job offer. Your grand daughter is growing so fast. Her little bolero is so precious. Seems like she loves it as well. Now who would want a happy meal when you can have lobster?! LOL Great choice I would say. Thanks Robin, I will pass on your message. It’s funny, isn’t it – seven months without any job offers then two to choose from in the same week! Lilah is gorgeous and it’s a shame we live so far away and don’t get to see her as much as we’d like. Lots of rich food and drink this week – must give our stomachs a break over the next few days! Thanks Caren, it was a good week what with two job offers to choose from and lots of good food and company. Some schools don’t allow conkers anymore, so I’m told, some misguided health and safety policy no doubt. 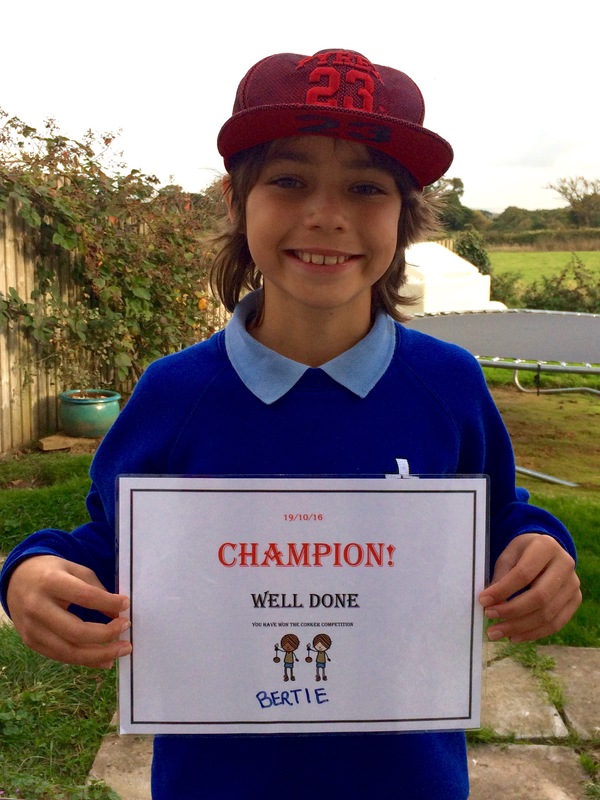 He was only making up numbers and ended up wining the whole competition, hence the ear-to-ear grin! I must say I was surprised to see that conkers were allowed again, though what a brilliant picture of your son, it could show all schools to allow them back to have such fun!! Mr H-L has done very well but it means he needs a whole new wardrobe – and suits are not cheap! The Boys are under instruction to iron when I say they have to, otherwise they’ll never bother, as you can imagine, as they’d be happy to go around in creased clothes. We don’t do fast food at all so it was nice that The Boys chose a proper restaurant for lunch, but what would have cost ten pounds at McDonald’s ended up as a bill of a hundred and ten!! Such a stunning week. Well done to Mr. H-L on the job, and the weight loss. Love the new sofa, it is going to look stunning. Your granddaughter is just so cute, and the boys are growing up so quickly. Nearly time for fires? Indeed, summer is coming along here as well. We finally had a little bit of rain on the weekend and loved it. So nice to see them not opting for Happy Meals. 🙂 Great taste already. Enjoy the rest of the week and take care. Thank you, Mr H-L has done well, hasn’t he? Having grown up children as well as little ones certainly makes you realise how quickly they grow up. I’m pleased with the sofa and it makes the lounge look bigger. Can’t wait until the other one arrives and we can get rid of the two huge ones that fill the space currently. We don’t do fast food at all, but that The Boys opted for something else is quite a relief! You have all done very well. I have grown up kids (daughter and son in law) but no little ones. We have a 3 year old in the family. 🙂 She is adorable. Growing up so fast indeed. I wish we did steer away from the fast foods as well. The only fast food we get is pizza. I am just not as good as the one restaurant here. Takes a bit to make, and we are happy to wait. The others are just a big no-no. Except for the coffee places, we have great ones here, really nice imported coffee. 🙂 We spoil ourselves every now and again with a cuppa. Looking forward to seeing your new photos after you have done the lounge. Bet it is going to look great. Well, I prefer old things with a bit of character and history (bit like Mr H-L!) 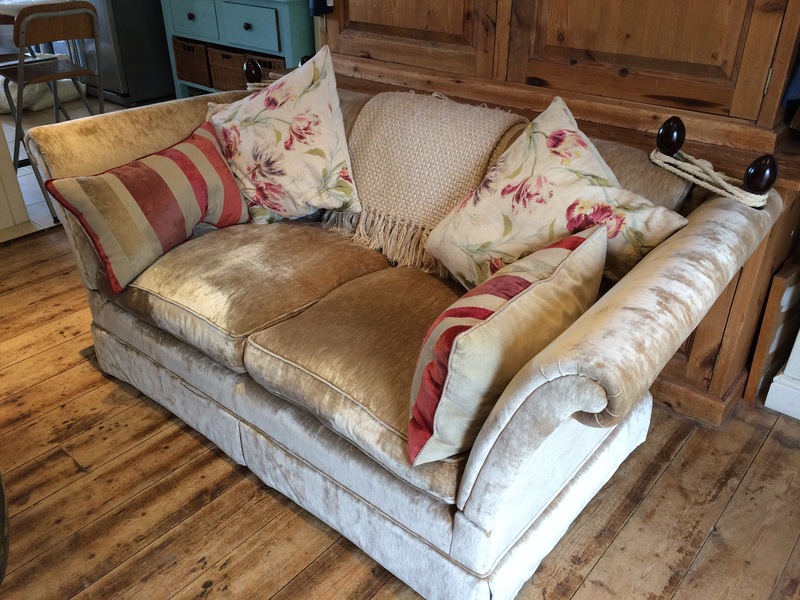 so eBay is perfect and secondhand is often ridiculously cheap – the sofa is Laura Ashley and looks brand new! I used to go to auctions back in the Eighties, but not since. I tend to buy the odd piece on impulse if I see something I like at a time when I need it. Not sure I could trust myself in an auction nowadays! !